Using my iPhone 3G with Rogers (Canada) service when I'm traveling in the US is very expensive. So instead I bought a T-Mobile Prepaid Pay As You Go SIM Card. This is just $6.99 from the T-Mobile web site. Look for their Pay As You Go plans and then for SIM Card Activation Kit. It comes with 10 minutes and they'll ship it to a US address for free. If you don't have a US address or need one immediately then you can just buy it at a T-Mobile store when you're in the US. The SIM card comes with an activation code and instructions. Basically you visit the T-Mobile web site and go to an activation page. From there you enter a number from the SIM card, the activation code, and the IMEI number of your iPhone (available in the General/About page on the iPhone). It is then supposed to activate and you have service. Unfortunately for me it was a little more involved. The activation failed, and directed me to call customer service. I spent about an hour going from one representative to the next. Eventually I did reach someone that was very helpful and straightened it all out. When you activate the SIM card you are given the option of adding more money at that time. If you do that with a credit card then you get an option to have them save that credit card number. Then to top up in future you can just text the last 4 digits of your credit card, and the amount that you want added to your account to the number 7777. When you do that you get a free text message back providing your new balance. Adding a T-Mobile data plan to your iPhone is also straightforward. Open the Safari browser and go to http://m.web2go.com. If you just go to any page it should redirect you there, but I've found that doesn't always work so I just bookmarked this link. From there you will click on My Account which will show you your current balance, and present a list of options. The first option in the list is to buy a web daypass. It is just $1.49 and provides unlimited data for 24 hours. Click the link, answer the various "are you sure", "are you really sure" prompts, and you're done. You now have unlimited data on your iPhone through T-Mobile. It's slower. You probably won't want to be watching YouTube videos. But for email, light browsing, and Google Maps, it's totally adequate. And at $1.49 for 24 hours unlimited, it's perfect if you're only in the US a few days a month. 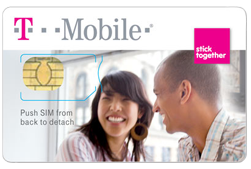 Your iPhone must be unlocked before you will be able to use a T-Mobile SIM card. Explaining how to unlock an iPhone is beyond what I can cover in this article. If you've never unlocked an iPhone before, and you're going to do it yourself, then you should probably plan on it taking 3-4 hours. I spent a Saturday afternoon researching it on the web, downloading the necessary things, and going through the steps multiple times because it didn't work the first (or second) time. In my experience, disabling 3G on your iPhone will help it find and connect to the T-Mobile network quicker, when it is first searching. Sometimes it is the only way I can get my iPhone to connect to T-Mobile. Don't forget to enable 3G again when you get home and put back in your original SIM card. I've also had occasions when I've purchased the web daypass, and it didn't immediately enable data. Each time that has happened, I've gone into settings and turned Airplane Mode on for a few seconds, and then back off again. Once the iPhone reconnects to the T-Mobile network data has been enabled. Removing/Inserting the SIM card is easy. I travel with the SIM card and a paper clip in a small zip lock. While I'm in the air flying into or out of the US, I poke the paper clip into the small hole on the top of the iPhone, which pushes out the SIM card tray. Pop the current SIM card into the zip lock, pop the new one into the tray and back into the phone. Done. Takes 10 seconds. My specific experiences here are with an iPhone 3G, but the T-Mobile Prepaid SIM card should work the same with any generation of iPhone. There are not a lot of GSM options in the US. And although AT&T does offer prepaid 3G SIM cards, they make it extremely difficult to buy these, especially if they think you might have an iPhone. Plus they are more expensive. All around, I've been extremely happy with the T-Mobile Pay As You Go SIM card in my iPhone 3G. better myself. You’ve really gone above and beyond with this article. Thank you very much. an micro sim for ipad and iphone 4 and iphone4s also available. unfortunately my german hardware just allows 2 g speed edge, not the possible 3g.